Driving along in the car this afternoon i noticed this lovely creeper hanging over the wall of one of the houses I passed on my way to the school to pick up my son. 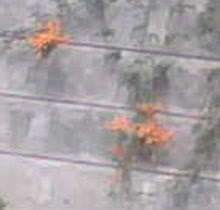 Sorry about the slightly fuzzy picture but I was driving remember and this is taken with my phone, but this is the creeper I spotted with its gorgeous orange flowers …. Anyway – sorry to divert there for a second but I just realised that I remember something about that in the highway code – something about keeping your eyes on the road ahead rather than watching the passers by on the pavement and admiring passing architecture, as this tends to lead to the increase in road accident statistics – which believe me in this country – need NO encouragement. But, as I was saying, i noticed this very pretty creeper with bright orange flowers on the side of the road, and I had one of those ‘flashback’ moments to my childhood that brought a smile to my face, and that was – the taste of those pretty orange flowers!! I haven’t eaten any grass recently….. 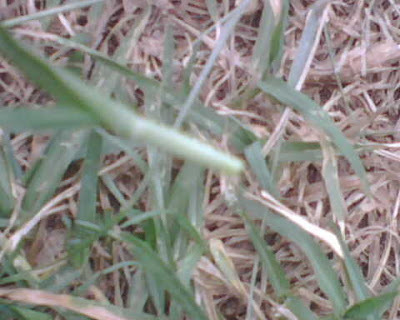 Anyway you see that light green bit of grass that I’ve so brilliantly taken a photo of (- its the fuzzy, out of focus bit, in case you’re not sure what I’m on about), well that bit of the grass is really juicy and sweet and yummy too. « New Kenya begins . .
You are not alone. I love honeysuckle… and the whiteish bit of grass. Nuttycow – glad to hear it girl, and I hear termites are fab when barbequed – but how would I know ??!? Belle – I know what you mean, I kind of miss the grass chewing and our long rainy season is about to set in and the grass will be lovely and green and ….oooh, oooh, oooh, excuse me whilst I trot down to the paddock and join the horses! Termites are fab raw, but chewing grass is a bit much, unless your name is Nebuchadnezzar. I thought only dogs ate greass – and just to make themselves sick?? You’re totally mad, just like the rest of us!! Just bumped into (not literally – I keep my eyes on the road) your warthogs and children sign at KWS -thought it looked familiar. On the last leg of my tour, spending Easter in Nbi rather than with GF on coast – boss at KWS wanted to see me before the holidays and I can’t get back easily. Aims – think I might have to send you some honeysuckles so you’re not missing out! Mr Bananas – Nebuchadnezzar is my middle name – how did you know? Expatmum – that’s true, although I never quite understand it as grass doesn’t seem to make me sick at all. Well, I suppose it might prove at least I’m not such a ‘dog’ after all! DM – sorry you didn’t get to spend Easter with your girlfriend in the South Coast but Nairobi can be fun too…. you can sit in the traffic all weekend instead – much more fun. Of course you’re insane. Why else would I read you blog? Kenton College has no knowledge,all they eat is bread and porridge. Etc. etc. Now I smoke grass (when applicable), stroke chameleons (with the head of course)(and when necessary), bathe in chocolate (just because I’ve never done that but want to) and pop datura stromonium seeds to hallucinate (I hear the last guy that did that found himself gazing at the pyramids in Giza the next morning). I still eat Honey Suckle though. I will always love her. You are what you eat? Absolutely not! Lean times though. Yep, this brought back good memories. I chewed grass washed down with honeysuckle from when I was about 5yrs old until I left boarding school at 18. It might have been boarding school…Good to see how ‘normal’ and unpretentious your blog is i.e a true Kenyan. Ty – Thanks for that and hope yours was too. Anonymous ONE – Take it you were a Turi boarder then! Anonymous TWO – Glad to see lots of others agreeing on the essential flowers and plants fodder to get us all through boarding school!